Teachers educate children by planning and conducting an education programme to develop literacy, numeracy and the physical, emotional, intellectual and social growth of their students. They facilitate learning by establishing a relationship with pupils, and by their organisation of learning resources and the classroom learning environment. 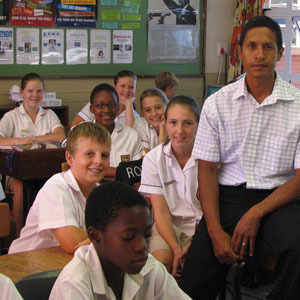 They assess and record progress and prepare pupils for examinations. prepare for and attend parent/teacher interviews. Why did you choose teaching? Not only did I come from a family of teachers, I started coaching karate at a very young age at my own club. I was very passionate about it and really enjoyed it. It was inevitable that I would end up following this path. Where did you study? I did a four-year Higher Diploma in Education at Bechet College of Education. It involved formal theoretical training, and practical teaching at various schools. Is experience as important as training? Yes, definitely. When starting out you should learn as much as you can from experienced teachers. What characteristics should a teacher possess They should be a people person; someone who is comfortable with others and enjoys interacting with young and old alike. You need to be caring and possess patience and understanding. What do you like the most about your work? I like the idea that every day is different. Most importantly, however, is the fact that I’m playing a role in shaping the lives of our youths. What don’t you like? Administration! Describe your typical day It starts with a staff briefing to discuss the day ahead, then the teachers head to the classrooms, where we administer work, teaching our class the subjects according to the timetable. We have a lunch and tea break during the academic day. Then our extramural programme begins, when we coach sport or are involved in arts and cultural activities. Career highlight? The letters I receive at the end of the year from the learners and parents thanking me for the wonderful year. What do you do when you’re not teaching? Trail running, roof gardening, interior design and up-cycling second-hand furniture. I like to try my hand at DIY! Advice for newbies? Never stop learning! Surround yourself with positive people who are inspiring and share your enjoyment for what you do. Why did you choose this profession? It was a mistake, I saw an advertisement in the newspaper and I didn’t know that they were looking for a qualified teacher, so I applied. I was working at the College of Magic at the time, teaching children to be magicians and clowns. What training have you undergone? I completed a three-year course in IT at Peninsula Technikon, but I didn’t have any teacher training when I applied. Following an interview, the head of education offered me a position as an apprentice teacher, because I was not qualified for the full teacher position, and I guess they didn’t want to lose me. The company enrolled me with UNISA to study Zoology and Environmental Science. That was in 2005. Last year I was offered a full-time teacher position. What type of personality best suits teaching? You have to love working with people and animals. Part of my job, besides teaching, is looking after sea creatures. Is experience as important as formal training? Experience is important because you have to learn how to control your class, and you learn more about sea creatures all the time. What do you like the most about your job? I teach students who have never been to the beach before, or have never touched the sea creatures. I like teaching learners about looking after their environment. Any advice to share with someone just starting out in your line of work? I would appeal to Xhosa-speaking people to think about trying it. It is an exciting career that many are not aware of. What’s been the highlight of your career to date? A major highlight is the changes I believe I am making to many young lives on a daily basis by educating them about all sorts of things they never thought about as important before, such as sharks, eels, turtles, penguins, fish, and other marine animals. Share one of your future goals I dream of becoming an environmental teacher at a special wetland in Khayelitsha that belongs to the city of Cape Town. All the schools in Khayelitsha could use that wetland as their very own nature conservation wetland research area. Describe your job in three words Respect our oceans. Why did you choose this profession? I have always had a passion for little children, probably because I used to babysit my nephew and nieces so much when I was a teenager. I have a huge family consisting of six sisters and two brothers, and we have fourteen children between us. I am blessed to have so many children around me. After matric I had the opportunity to start working at St Cyprian’s School, first fulfilling cleaning duties and then, after two years, being employed as an assistant teacher. I am currently in my ninth year of being employed by the school, and am still loving it. What training did you undergo and where? I started an ECD (Early Childhood Development) course at Owl College, but decided to delay completion of this course as I had taken on the responsibility of running the school’s aftercare facility. I just found that I did not have enough hours in the day to dedicate to the course. But I have definite plans to further my education in the near future, and even dream of being a qualified teacher myself one day. Describe a typical day in the classroom Wow! I have so many responsibilities, ranging from helping the little girls in my care, setting up the classroom and playground, and cleaning up. I have very busy days, but I enjoy every minute, and am never bored because each day brings new surprises. I also spend time planning the week’s work with the teacher, and I enjoy learning more about educational topics and ideas. What do you enjoy most about your work? Definitely the kids – their laughter, love, joy and sense of fun! I work in a light-hearted environment, and get along well with my colleagues. I get to laugh, have fun and learn, all at the same time. Anything you don’t you like? When I get sick and can’t be with them. Any hurdles you have had to overcome? I worked with the youngest age group (three- to four-year-olds) for about five years and this is by far the most taxing age group to manage. You need a lot of patience, commitment and consistency with that age group! I am so proud I managed to achieve that. What’s been the highlight of your career to date? I am currently working with the Grade R class, and it has given me so much motivation that I am actually moving forward in my own studies this year. Your future goals? To complete my studies and become a teacher. In the classroom setting, is experience as important as training? Definitely, practice makes perfect. What traits should an assistant teacher have? You must always be cheerful, responsible, loving and caring. You must also have plenty of patience because you are working with little people who need quite a lot of help. What advice would you give to someone starting out? Firstly, make sure that you want to work with children. As I said, you need to have loads of patience, and teaching is not for everyone! You must enjoy what you do in order to love your work. A bachelor’s degree is usually needed to become a teacher. It is also possible to study for a teaching diploma, which can be upgraded to a degree. Generally, one has to complete an approved teacher training programme and practical training. For teachers focusing on a specific subject, a related bachelor’s degree is recommended. This can then be followed by a PGCE (Postgraduate Certificate in Education). Prospective teachers may also study for a Bachelor of Education degree, which combines theoretical training with practical teaching experience. A National Senior Certificate that meets the requirements for a diploma or degree course is a prerequisite for studying teaching courses.